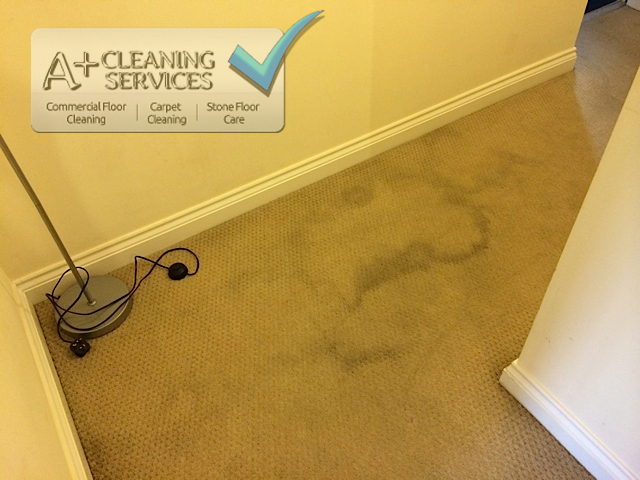 We are carpet cleaners Gloucester, and this job was part of an end of tenancy contract. 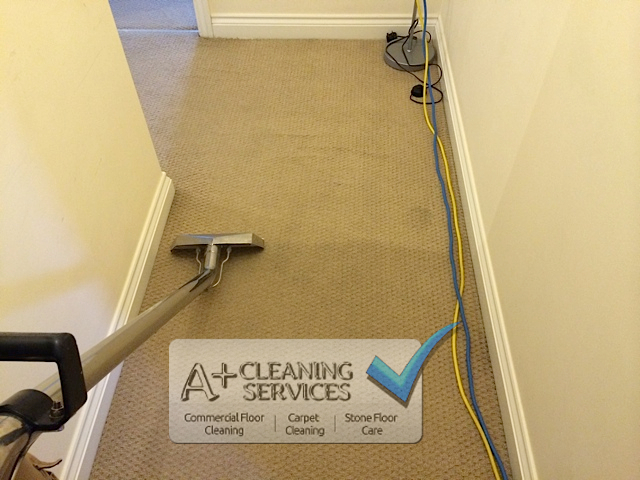 The tenant had been living here for 3 years, and decided to spruce up the carpet half way through the tenancy. The tenant chose to opt for a hire machine. As professional carpet cleaners, you can imagine we have much to say on this subject. Fear not, this isn’t a rant, so we’ll keep it short and sweet. These hire machines use a detergent for their cleaning chemical. Detergents, in their very nature are sticky. They grab indiscriminately onto dirt and carpet alike, and won’t let go. Sticky means unless you have adequate water flow, enough heat and enough vacuum power (a powerful extraction machine) you will leave a residue in your carpet. Sticky residue means a sticky carpet. A sticky carpet will get dirtier quicker than a clean carpet. So in the short term, it might seem worth saving your money. But in the photo below you can see what really happens over time. 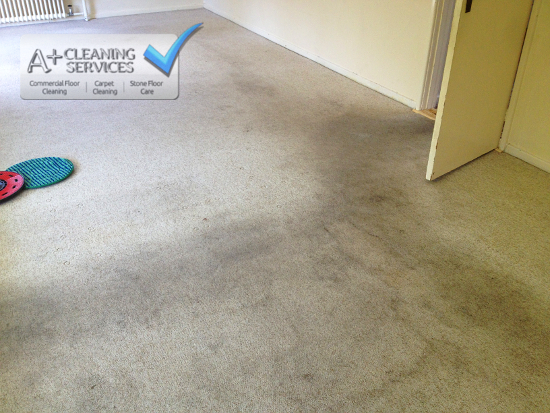 Carpet Cleaner Gloucester – Before cleaning. 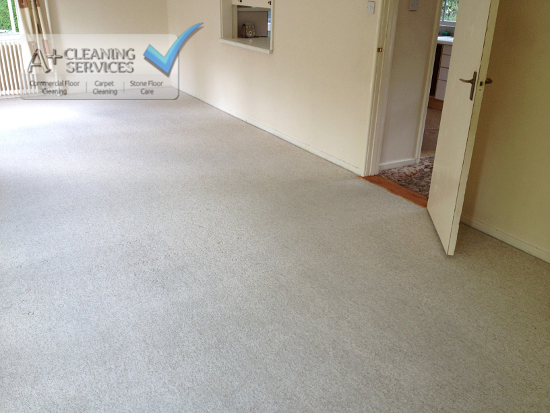 Carpet Cleaner Gloucester – After carpet cleaning. 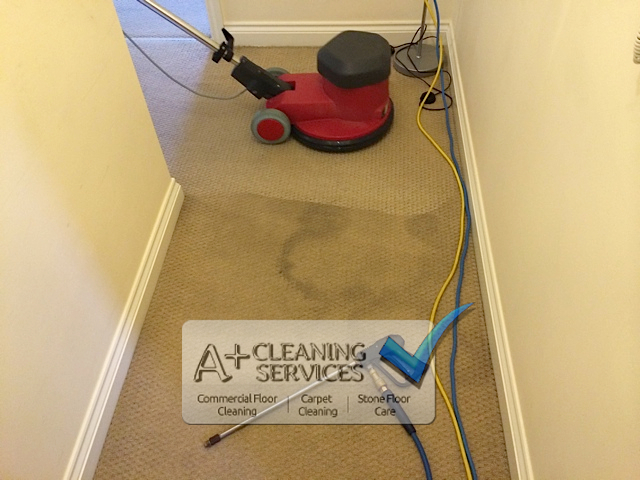 When extracting the carpet, we allowed for the large volume of detergent and increased the water flow. This ensured that all the detergent was thoroughly rinsed out of the carpet. 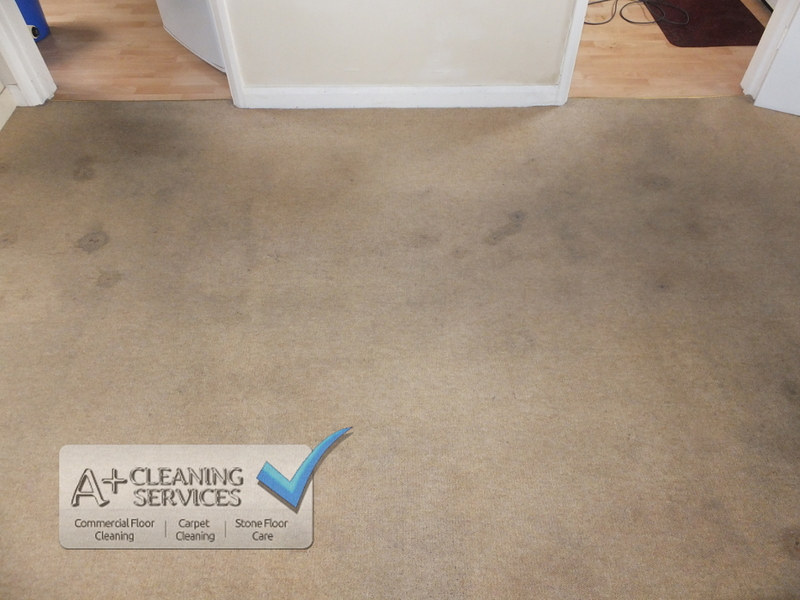 The result of this modern cleaning science is a carpet that is deep cleaned, and will not re-soil at at accelerated rate. Don’t forget a happy tenant who had their deposit returned. For more information on what we can offer you click here. 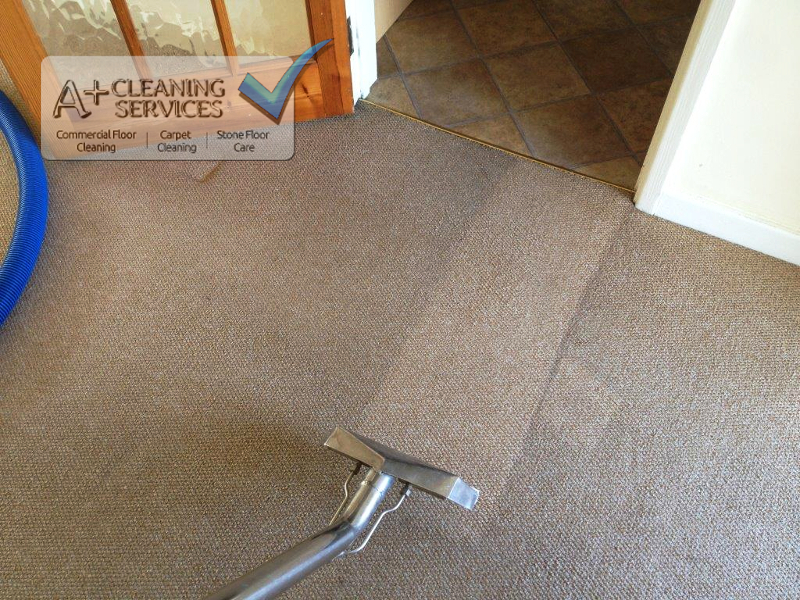 If you’re looking for a carpet cleaner Stroud, here’s what we can do for you. The small black stain on this carpet was an ink stain which had not been treated in any way. This meant the ink was not spread around and much more controllable when treating. Because it was a smaller area to treat it meant the risk of further spreading was lower. On the other hand, frequent blotting was required to help control this, but resulted in an effective removal. The two larger stains were spills of some sort and required a bit more attention. Because this carpet pile was so long, plenty of agitation was required on these spills. In order to reach the further down the carpet fibres a soft brush was required (as seen below). Thankfully, this carpet had a 100% polypropylene face pile which meant it was fairly resistant to water soluble stains such as these. 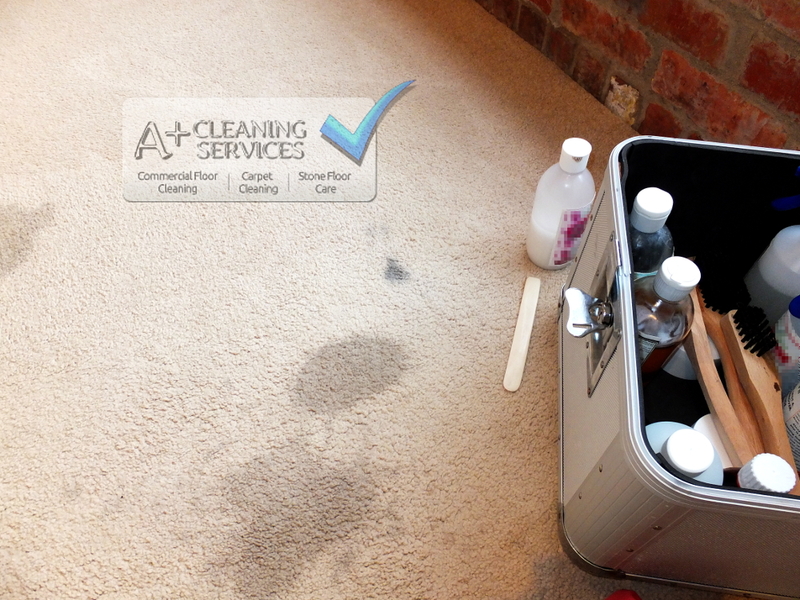 These stains are considered problem stains because they need to be tackled seperately from general soiling. Therefore advanced stain treatment techniques are necessary, especially in the cases of wine and tea stains. As this carpet is solution dyed polypropylene, the risk of colours being set in is reduced greatly due to the ‘impervious’ nature of the material. However, the improper use of certain household carpet spotters can create the conditions needed for permanent colour loss/damage, so be careful when using these products. So the advanced stain treatment was a success thanks to the stains being relatively recent, and the polypropylene face pile was an advantage in this case. As the last photo shows, the carpet looked good when finished with. It goes without saying this has many health risks, especially in regards to the blood stains not being hygienically treated. 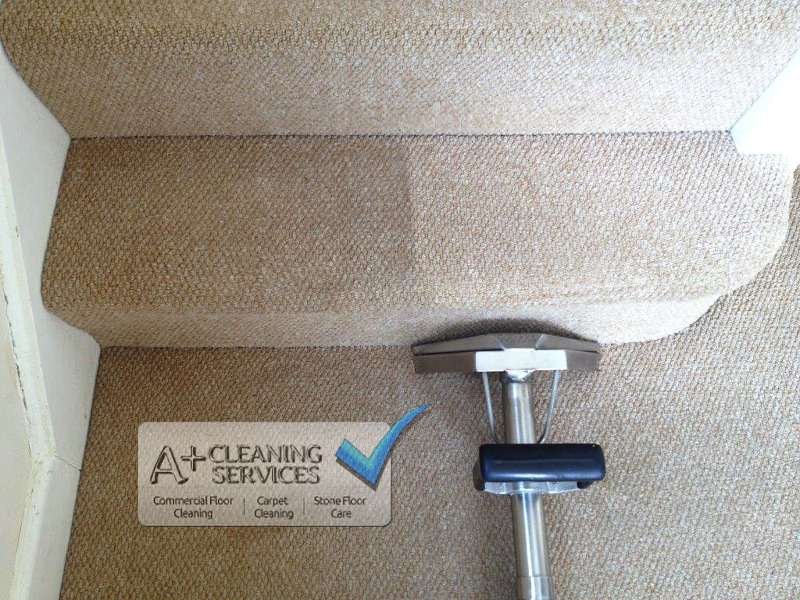 The carpet was treated with an antibacterial cleaning solution, and the gummy spots were tackled. Because the carpet had a high wool content, there was a risk that the blood stains would become permanently stained. This meant a longer dwell time for the cleaning solution to completely penetrate the woollen fibres. 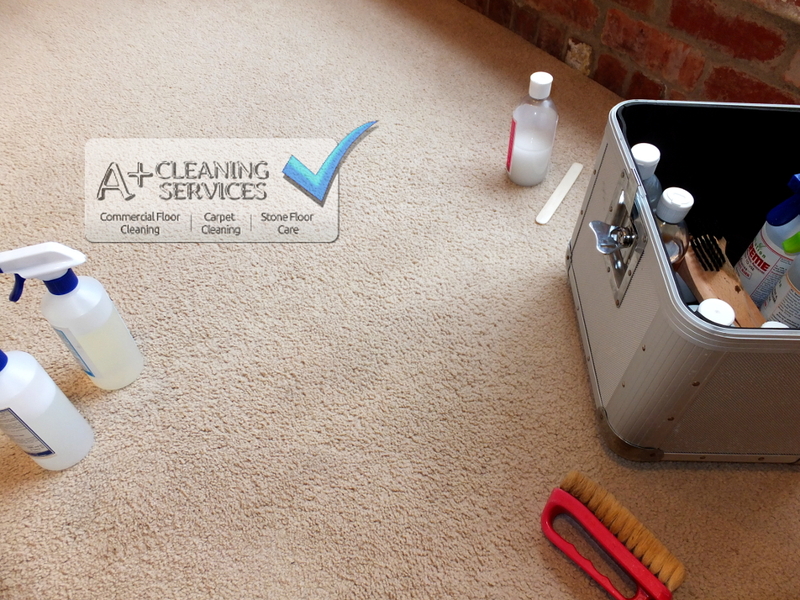 The carpet was then applied with another cleaning solution and agitated for optimal results. The additional cleaning solution was to target any general dirt and grime that remained. Finally the carpet was hot water extracted. You can see the results of the carpet clean above. 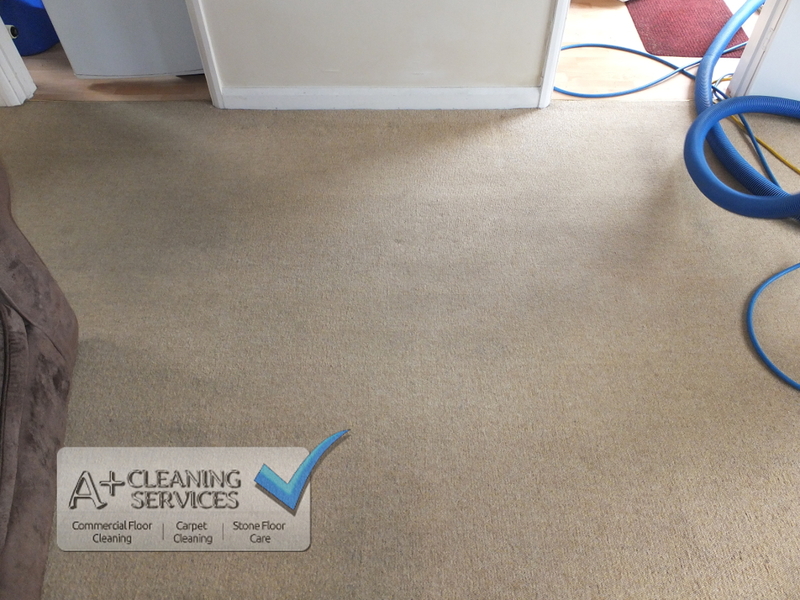 As a precaution we gave the carpet a light overspray of the antibacterial solution to continue working on the carpet as all the soil had been removed from the carpet. This meant the treatment would be more effective, making it safer for the new tenants.